The bottom drops out of the stock market but the dividends continue to roll in. I received £140.03, which brings the total dividends received this year to £3,071.47 – yes, target reached! In the face of doom, gloom and stock market volatility, this graph continues to make me smile. 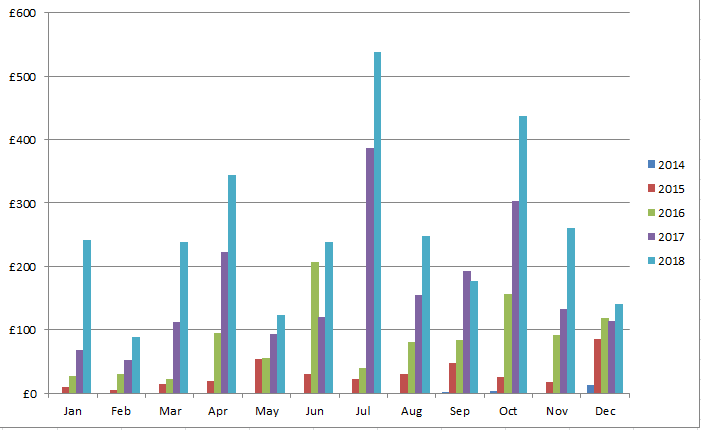 It’s great to see my passive income grow every year, although I think in future, I might track the SIPP/ISA split. A busy month meant that I only had a couple of weeks to do any MB. EW betting finished up badly as I didn’t have any time to recoup my losses. Fortunately, my no-lay accas didn’t do too badly so cushioned the blow somewhat. 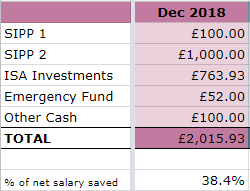 I ended up making just a small profit of £232.33 – total profit made for the year was £4,526, which is actually the biggest annual profit I’ve made so far in my years of MB. Not the mega-riches that some matched bettors report but it’s more than enough for me for the effort I put in and of course, it’s all tax free. 4 out of 6 isn’t too bad, so I’m satisfied overall with what I’ve achieved. I didn’t set it as a goal but I pledged (to myself) to donate at least 10% of my MB profits to charity. In the end, I donated over £474 (which includes the £240 toilet twinning) so I’m happy with that. I didn’t quite manage to get ‘House’ but it was a fair attempt – I may give this (or similar) another go for 2019. I think it’s been a good, though not exceptional year. Perhaps this is because of how dismally the stock markets have performed, affecting my investments and my Future Fund. Sure, I ended up with the employee of the year thing and achieving my target weight but meh, it’s not really been a year of highs. Then again, there have been very few lows so perhaps I should just count myself fortunate in that respect – I hate drama so I should definitely not wish for it! I think I’ve been pretty with good with my spending in 2018 so I need to continue with this, maintain my focus. Investments-wise, I’ve continued to plough most of my money into investment trusts and will likely continue to do so. And that’s pretty much it. Just finalising my post for my goals of 2019 so that will be up soon. Hope you all had a great 2018! 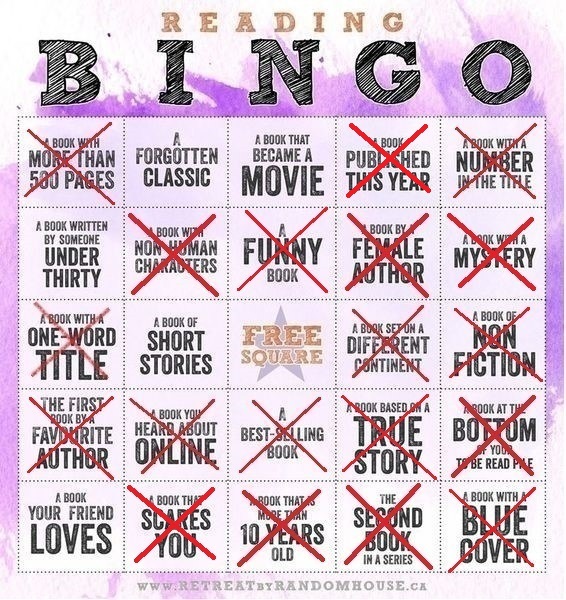 *edited to add Book Bingo. This entry was posted in Books, charity, Dividend Investing, Earnings, Expenses, Investment Trusts, matched betting, Portfolio, Savings, Shares, Work by weenie. Bookmark the permalink. Nice blog. Liked the approach of keeping a track of “money in” and “money out”, which is useful in weeding out unnecessary expenses (and hence, help in staking steps towards FIRE) . I hope to follow couple of points mentioned in your blog in my life too, with the same objective – FIRE. Thanks Nikesh and all the best for your FIRE goals in 2019. Nice work on that 43% savings rate an effort that’s better than I’d guess 99.9% of the population… Looking back on my FIRE journey savings rate was probably the most important element of this whole lark. Everything else can then build upon it. Chin up on the investments front though. We all know that Mr Market will both giveth and taketh over an investing lifetime. The most surprising thing for me is why we haven’t seen much of this type of action in the last 10 years… Plus there’s nothing you can do about it but continue to buy and rebalance if needed. Yes, the savings rate is better than most of the population so there is that – I just need to decide if I want to really push for higher. Although it feels horrid with all the numbers going backwards, I’m glad Mr Market is falling now, rather than later (although this could still happen!). While, I’m still accumulating, all I can do is continue to buy. Happy new year weenie. For me I’m almost glad the markets have tanked (admittedly I’d have preferred it to be before not after I lumped 40k into them!) but it’s enabled me to see how I react to a substantial drop. I’m down about 11% on my initial investment and that’s with adding more since so more like 20% overall. I’m happy I’ve not had more than a passing interest in what’s happening and have continued to buy more so that’s good. You make an interesting point about your reaction to the drop – I’ve reacted by avoiding looking at my numbers (except when I’m doing my usual updates) so perhaps this is a good exercise and good experience! All the best for 2019 when you can invest the extra money you’ll get when you get rid of your ‘silly car’! Will have to start cooking up a few simple goal ideas as well. I’m thinking maybe to match my take home work pay with matched betting. A big ask but I reckon it could be done! I had an end of year draft ready so just really needed to populate the numbers but you’re right, not being out on NYE did mean I could get this out quicker. Still suffering from jet lag, should be sorted by the weekend. I’ll be keeping my goals simple again and not too different. All the best with 2019 and yes, I reckon you could smash that MB goal! Haha! I’d make a terrible weegie weenie though, my Scottish accent is abysmal! Happy New Year! Sounds like a solid year overall – and it’s definitely good to acknowledge the years where nothing majorly unfortunate happens! Look forward to reading about your 2019 goals. I just figured mine out today and am in equal parts excited and overwhelmed. Yes, I think uneventful years are underrated! I guess it’s nice to have years where lots of things happen but only if these things are positive and you know life isn’t like that! All the best with 2019 – I look forward to reading how you get on with your return to the UK! Hi Weenie, glad to hear you had a fabulous break in Hong Kong. I was also tucked up nicely through the bells – going out just really doesn’t appeal to me nowadays. Happy New Year, Ms ZiYou. I still do enjoy going out but gone are the days where I will go to every single social event! There’s no need! Congratulations on achieving 3000+ in dividend income for the year. Seems like the Dogs of the FTSE strategy is really paying off! Thanks Wice, although the Dogs of the FTSE strategy only forms a very small part of my investment portfolio (around 2%) as it’s only an experiment I am running! In the past months I made my first 25€ of passive income. YES! 😉 I follow a totally different (higher risk/expansion) strategy than you, but indeed, the fact that it gets paid out no matter what is a little (or big in your case) ray of sunshine in these dark(er) times. Thanks Marc and happy new year to you too! Congrats on your first passive income, the first of many payments! Happy new year to you Weenie, I hope you had a good holiday season. I’m very jealous of your dividend income over the past year given that my accumulator shares managed to lose value in the same time! Happy New Year, ERG and yes, I enjoyed a good break thanks. Hard to distinguish the ‘income’ generated by your accumulator shares but it’ll be hidden in there somewhere! However, not being able to see it easily is one reason why I’m aiming for income-generating investments for part of my portfolio as I want to actually see what income I can get. To be honest I’m not sure that there are many people who look back on their 2018 investing returns with much pleasure. But I am reminded that we have had a nine years in a row of positive returns so having one (or even two or three) down years should be expected. I’m not heading into drawdown mode for a long while so there will be many more ups (and downs) to come! Celebrate the fact that you’ve hit 2/3 of your goals. Having goals and hitting any of them puts you way ahead of the field! Yes, it was about time the markets corrected themselves, I’ve been expecting it happen and in a way been wanting it to happen – just doesn’t feel good when I have to continue to update and track my portfolio and the numbers are going backwards! A very happy new year to you, may there be more excitement and fun while continuing the run of very few lows at the same time. Congrats on achieving 4 of your goals, that’s really good going. I particularly congratulate you on the £4K matched betting achievement, given that we had a similar goal last year of making that £4K and I didn’t quit manage to hit mine. Never mind I’ll be trying even harder this year to up my income hustle game! Whenever I read about your dividend income I feel envious. I’d really like to get into dividend income investing, but I don’t know how to choose funds to invest in and fear that the learning curve is steep. Focusing my efforts on learning how to do it would take away from my precious income hustle time! I’m still contemplating it though. Looking forward to hearing of your 2019 goals. Thanks for the congratulations, after a rocky start, I didn’t think I would get anywhere near the matched betting goal so I’m glad I stuck with it. Unlucky that you didn’t manage to hit your own goal and all the best for this goal for this year. 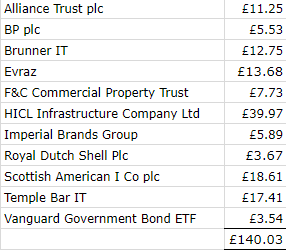 Regarding my dividend income, a large part of it comes from income-paying index tracker ETFs, eg Vanguard FTSE All World ETF (VWRL) which is a global tracker. If you’re investing in index trackers anyway, that might be an option for you to consider, without having to read up about individual stocks or investment trusts.